2. 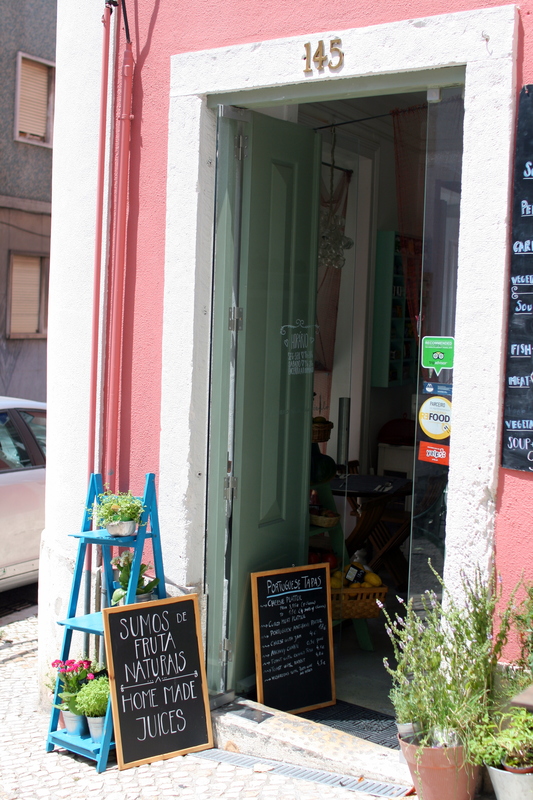 Every time you come back, you continue to be impressed and surprised by the food, which is due to the fact that Mercearia do Século has a small menu which changes almost daily. After about a year of regular visits, you have amassed a couple of culinary highlights, once eaten, never forgotten: the amazing Moroccan lamb with the lightest, fluffiest couscous, the pork cheeks cooked in red wine and a bunch of secret spices with a lovely puree of sweet potato and a perfect Gazpacho: light, vibrant in colour and highly charged in taste of the original, fresh ingredients – apparently in the old days, Gazpacho was no more than an Alentejan farmer’s bread soup with garlic, water and vinegar to which tomatoes were only added occasionally. But whatever it is that you might get, it’s always going to be good, really fresh and well made: whether it’s Portuguese food with a sophisticated twist or Arab styled cooking, you really cannot go wrong here. 3. The desserts! The desserts! Pastries, cookies, cakes. It’s all good and most of it homemade. And almost all taste of wholesome butter. This is not the kind of place where you should care about that. 4. On a hot summer’s day, you make an attempt at imitating the fantastically refreshing ginger-mint lemonade Fernanda serves and end up longing for the real deal. 5. You have about 10 or so stories to tell about a space which is really not much bigger than 30 square meters. You have taken friends there, have taken friends’ moms there, have made friends there, have spent time there with Couchsurfers, it really is one of your go-to-places. Anyone you suspect of having a decent palate or at the very least a lust for life, you take to Fernanda. Be prepared to leave with a good story to tell the grandchildren. 6. You do not only go there for the food, but as well because it’s half-restaurant half-market with some specialty, high quality products. Maybe at first, Mercearia do Século seemed like it would be a hipster-tourist trap, but none of that. There are a lot of things to recommend or try here, but one of the highlights was the muxama (salted, cured tuna, as good as any air-dried ham) and the coelho ao escabeche (marinated rabbit). You have also developed quite an intimate relationship with the late bottled vintage portwine they have for sale and the recent addition of some artisanal high-quality Portuguese beers made you waggle outside quite happily whenever you had it together with your lunch. 7. You gladly pay a little bit more for such great quality. It could also be due to the fact that you always have just a bit too much to drink there. In any case, you’re glad. Shut up and enjoy it. 8. Whenever you look out of the window with the decorated fish nets, you always feel a little bit at home. 9. Writing your blog article, all of a sudden you remember how a bacalhau com natas (gratinated codfish with cream) was the best you have ever had. The sauce was so creamy. And it really tasted of cod. Oh my cod! 11. You have to fall back on such a cheap blogger’s trick as making lists because you cannot find any other way to write about one of your favorite restaurants without sounding disingenuous or too uncritical.